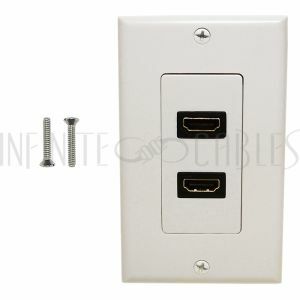 This wall plate kit consists of a Decora wall plate, and 2 x HDMI female to female insert. It is compatible with standard North American electrical openings, data clips or surface mount boxes. This wall plate kit consists of a wall plate, an HDMI female to female insert, and a F-type female to female insert. It is compatible with standard North American electrical openings, data clips or surface mount boxes. This wall plate kit consists of a wall plate, and a HDMI female to female insert. It is compatible with standard North American electrical openings, data clips or surface mount boxes. 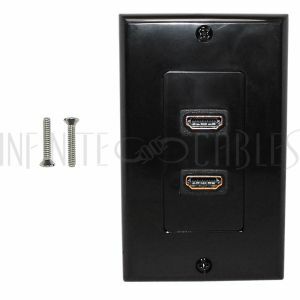 This wall plate kit consists of a wall plate, and 2 x HDMI female to female insert. It is compatible with standard North American electrical openings, data clips or surface mount boxes. This wall plate kit consists of a wall plate, and 3 x HDMI female to female insert. It is compatible with standard North American electrical openings, data clips or surface mount boxes. This wall plate kit consists of a wall plate, and 4 x HDMI female to female insert. It is compatible with standard North American electrical openings, data clips or surface mount boxes. This wall plate kit consists of a wall plate, an HDMI female to female insert, and a Toslink female to female insert. It is compatible with standard North American electrical openings, data clips or surface mount boxes. This wall plate kit consists of a wall plate, an HDMI female to female insert, and a Digi-Coax (Blue) female to female insert. It is compatible with standard North American electrical openings, data clips or surface mount boxes. This wall plate kit consists of a Decora wall plate, and a HDMI female to female insert. It is compatible with standard North American electrical openings, data clips or surface mount boxes and is used to provide an easy connection between an output source and a remove devise or display. 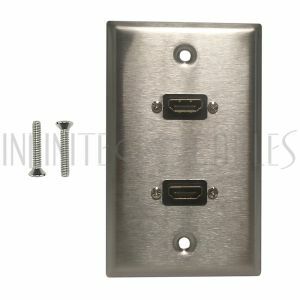 This wall plate kit consists of a Decora wall plate, and 2 x HDMI female to female insert. It is compatible with standard North American electrical openings, data clips or surface mount boxes and is used to provide an easy connection between an output source and a remove devise or display. This wall plate kit consists of a wall plate, an HDMI female to female insert, and a F-type female to female insert. It is compatible with standard North American electrical openings, data clips or surface mount boxes and is used to provide an easy connection between an output source and a remove devise or display.